^ "Korean Demilitarized Zone: Image of the Day". NASA Earth Observatory. Archived from the original on 16 March 2010. Retrieved 26 March 2010. ^ Ahn, JH (21 March 2016). "On patrol in the DMZ: North Korean landmines, biting winds and tin cans: As tensions on the peninsula escalate, a former South Korean guard describes life at one of the world's most fortified borders. NK News reports". The Guardian. Archived from the original on 16 April 2016. Retrieved 18 April 2016. ^ a b c "DMZ sixth-graders become graduates". Stars and Stripes. 19 February 2008. Archived from the original on 11 June 2009. ^ "Santa mobbed by students during visit to Joint Security Area". army.mil.com -The Official U.S. Army Website. Archived from the original on 24 November 2009. Retrieved 11 December 2009. ^ Agency, Reuters News (1 October 2018). "North and South Korea begin removing landmines along fortified DMZ". The Telegraph. ISSN 0307-1235. Retrieved 19 November 2018. ^ "Panmunjon". army.mil.com. Archived from the original on 5 September 2009. Retrieved 15 December 2009. 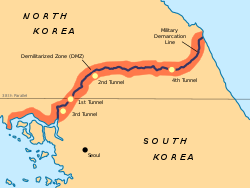 ^ "Korea Demilitarized Zone Incidents". 28 May 2009. Archived from the original on 31 March 2010. 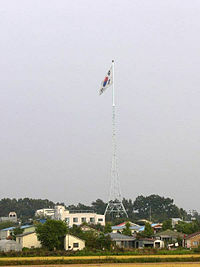 ^ "South Korea to revamp DMZ towers". Stars and Stripes. 22 October 2009. Archived from the original on 22 October 2009. Retrieved 9 November 2009. ^ TONG-HYUNG, KIM. "Koreas agree to break ground on inter-Korean railroad". Kait8.com. Retrieved 19 November 2018. ^ a b Potts, Rolf (3 February 1999). "Korea's No-man's-land". Salon. Archived from the original on 15 February 2013. 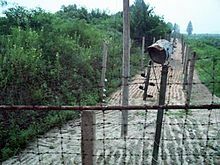 ^ "CNN.com – Korea's DMZ: 'Scariest place on Earth'". 20 February 2002. Archived from the original on 12 October 2007. Retrieved 23 October 2007. 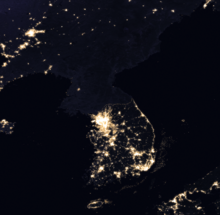 ^ "North Korea: Chronology of Provocations, 1950 – 2003" (PDF). Archived from the original (PDF) on 5 September 2006. Retrieved 2 February 2012. ^ "Scenes from an Unfinished War: Low-Intensity Conflict in Korea, 1966–1968" (PDF). Cgsc.leavenworth.army.mil. Archived from the original (PDF) on 25 March 2009. Retrieved 2 February 2012. 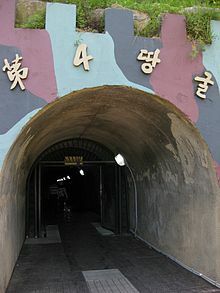 ^ "Demilitarized Zone". GlobalSecurity.org. Archived from the original on 5 November 2007. Retrieved 9 November 2007. ^ Bermudez, Joseph S. Jr. "Tunnels under the DMZ". korean-war.com. Archived from the original on 21 June 2013. Retrieved 26 March 2010. ^ a b "Welcome to North Korea: A film by Peter Tetteroo for KRO Television". Archived from the original on 11 July 2011. Retrieved 29 December 2009. ^ "New York Times, 1999". Korean-war.com. Archived from the original on 8 March 2012. Retrieved 2 February 2012. ^ "Tear Down the Korean Wall". 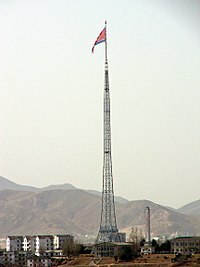 DPRK UN Mission. 3 December 1999. Archived from the original on 29 March 2006. Retrieved 29 October 2007. ^ "The Growing Danger of Great-Power Conflict". The Economist. Retrieved 5 February 2018. ^ Park, Ju-Min (10 August 2015). "South Korea condemns North over land mine blast, vows retaliation". Seoul: Reuters. Archived from the original on 10 August 2015. Retrieved 10 August 2015. ^ "South Korea turns off propaganda as Koreas reach deal". 25 August 2015. Archived from the original on 24 September 2015. Retrieved 25 August 2015. ^ Kim, Sam (7 January 2016). "South Korea Punishes Kim Jong Un With K-Pop for Nuclear Test". Bloomsberg. Archived from the original on 7 January 2016. Retrieved 8 January 2016. ^ CNN, Joshua Berlinger and Yoonjung Seo,. "South Korea stops blasting propaganda along DMZ as summit looms". CNN. Retrieved 19 November 2018. ^ "North And South Korea Dismantle Loudspeakers Blaring Propaganda On The DMZ : The Two-Way". NPR. 1 May 2018. Retrieved 1 October 2018. ^ "South Korea faces a decision over leaflets as ties warm with the North". Public Radio International. Retrieved 19 November 2018. ^ "Kor". Koreana: Korean culture & arts (in Korean). Retrieved 17 March 2017. ^ "Archived copy". Archived from the original on 12 March 2017. Retrieved 11 March 2017. CS1 maint: Archived copy as title (link) Retrieved 10 March 2017. Many pictures, maps, and description of the old Taebong capital that is stuck in the middle of the DMZ. ^ Chang, Jae-Soon (28 November 2008). 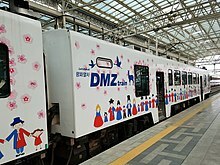 "Last train to Kaesong as Korean relations cool". Edinburgh: News.Scotman.Com. ^ "Inter-Korean economic cooperation Kaesong office reopens". Englishhani. 7 September 2009. Archived from the original on 22 July 2011. Retrieved 17 September 2009. ^ "ROK woman tourist shot dead at DPRK resort". China Daily. 12 July 2008. Archived from the original on 17 February 2012. ^ "N Korea steps up row with South". BBC. 3 August 2008. Archived from the original on 30 September 2009. 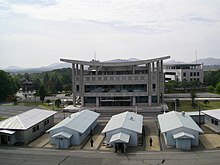 ^ "North Korea 'to seize property at Kumgang resort'". BBC. 23 April 2010. ^ a b c "Korea's DMZ: The thin green line". CNN. 22 August 2003. Archived from the original on 5 August 2009. Retrieved 30 July 2009. ^ "Korean 'Tigerman' Prowls the DMZ". International Korean News. Archived from the original on 13 August 2009. Retrieved 17 July 2009. ^ "Ted Turner: Turn Korean DMZ into peace park". USA TODAY. 18 November 2005. Archived from the original on 6 December 2009. Retrieved 7 May 2010. ^ a b Miller, Steve. "Koreas Continue Tension-Easing Talks as the North Criticizes US". VOA. Retrieved 19 November 2018. ^ "2 Koreas to destroy 22 front-line guard posts by November". AP NEWS. 26 October 2018. Retrieved 19 November 2018. ^ Jin-man, Lee. "2 Koreas to destroy 22 front-line guard posts by November". The Grand Island Independent. Retrieved 19 November 2018. ^ 송상호 (25 October 2018). "(LEAD) Two Koreas, UNC wrap up JSA disarmament". Yonhap News Agency. Retrieved 19 November 2018. ^ a b c d Shin, Hyonhee. "North and South Korea agree to scrap 22 guard posts at border next..." U.S. Retrieved 19 November 2018. ^ a b c "Two Koreas agree to withdraw 11 guard posts in border area by late November". Retrieved 19 November 2018. ^ "North and South Korea begin destroying border guard posts". Channel NewsAsia. Retrieved 19 November 2018. ^ a b "North and South Korea begin destroying border guard posts". Rappler. Retrieved 19 November 2018. ^ a b Press, Associated. "In latest trust-building step, North and South Korean military finish withdrawal from front-line guard posts". latimes.com. Retrieved 19 November 2018. ^ a b "North, South dismantle 22 guard posts along border". SFChronicle.com. 10 November 2018. Retrieved 19 November 2018. ^ a b c d e 이치동 (1 November 2018). "Koreas halt all 'hostile' military acts near border". Yonhap News Agency. Retrieved 19 November 2018. ^ a b c d "Two Koreas end military drills, begin operation of no-fly zone near MDL: MND | NK News - North Korea News". NK News - North Korea News. 31 October 2018. Retrieved 19 November 2018.